Do You Or Your Child Suffer From Test Anxiety? Lots of bright students of all ages report significant anxiety related to exams. To some extent, it is understandable since the world is quite competitive today and test scores can impact the kind of college you attend, the kind of career you have and the amount of money you earn. Test anxiety impacts children and adults. I have treated doctors, lawyers and graduate students who have had a huge amount of tension and anxiety related to licensure exams, certification exams and entrance exams. Adult students tend to recognize the symptoms of anxiety. One physician who I treated recently, knew the exam material very well. As he noted, “My problem with this test is my nerves.” Fortunately, he realized he needed help in learning how to calm down prior to the exam and during the actual test in order to pass his board exams. After a few counseling sessions, this doctor was able to successfully pass his certification exam. In addition, he reported little or no anxiety while taking the test. Younger students and their parents often mistakenly believe that prep classes and coaching will rid them of their test anxiety. Prep courses are useful, but they do not provide the right kind of help for the the student who has a great deal of anxiety. 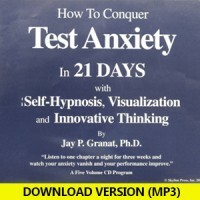 Symptoms of test anxiety include insomnia, nausea, a racing heart and sweaty palms. Some students report feeling dizzy and weak. Obviously, it is difficult to concentrate and perform well when you have these kinds of bodily sensations. When I counsel somebody with test anxiety, there are several things which must be explored. First, it is important to determine the person is anxious about other issues in their life. Some patients who report test anxiety are quite anxious in other situations as well. Some have multiple fears and phobias. This person requires a different kind of treatment than does someone who reports anxiety that is restricted to exams. Second, it is useful to get a thorough history and understanding as to the history etiology of the problem. Sometimes, test anxiety surfaces after a person does poorly on an important test. The person then begins to fear the next test. People who suffer from test anxiety benefit from training in test taking skills. I encourage them to do as many practice exams as they can and to develop a system for attacking the exam. Most people like having a uniform game plan for approaching specific parts of a standardized test. This helps them to feel comfortable in the exam room. We also spend time on the student’s pre-exam preparation. We talk about what they need to do the month before the test, the week before the test and the day of the test in order to feel ready and psychologically comfortable. Interestingly, the same tools that help athletes and actors to perform better seem to help people with test anxiety. If you or your child is suffering with test anxiety, you probably should seek the assistance of a mental health professional.